Deep blue sea and quiet coves protected by steep cliffs: a journey of discovery into an unspoilt natural oasis in the heart of the Mediterranean. We will leave the port for San Vito Lo Capo, a picturesque holiday resort well known for its beach. 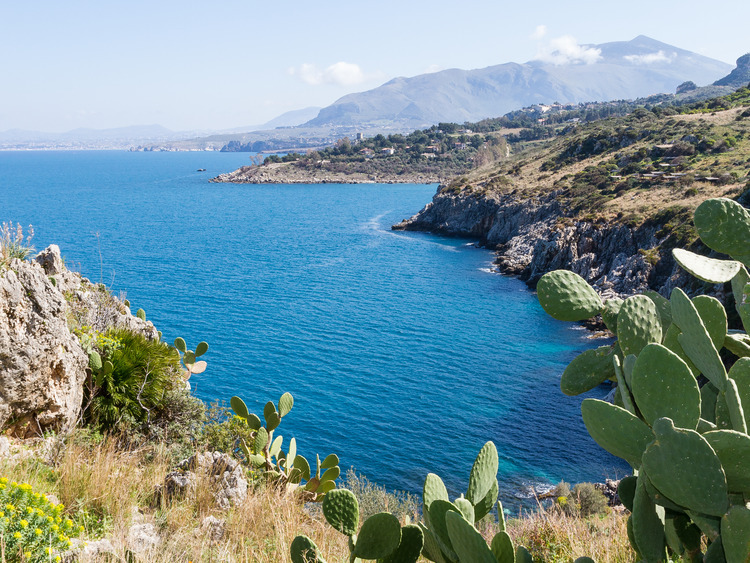 Shortly afterwards, we will arrive at the Zingaro Nature Reserve, a genuine oasis in the heart of the Mediterranean, located to the west of the Gulf of Castellammare, bordering the Tyrrhenian Sea between Castellammare del Golfo and Trapani. This 7 km coastline, extending over almost 1,700 hectares of land, welcomes us with its breath-taking landscape: small bays paved with white pebbles, sea tinged with unexpected greens and blues, jagged cliffs between the many beaches, vegetation that seems to be mirrored by the sea, and a string of old farmhouses built on the rock amid indescribable colours and fragrances. The coast path is framed by impressive centuries-old limestone formations: quaternary calcarenites and dolomitic limestone hills from the Mesozoic era, as well as cliffs that soar to 913 m (Monte Speziale) and slope gently into the sea, interspersed with coves and inlets. Our walk, which begins at the northern end of the reserve, will lead us to the spectacular Cala Tonnara dell'Uzzo, Cala dell'Uzzo and Cala Marinella. After observing the crystal clear waters from the coast, it's time for a refreshing dip in the pristine waters. To reinvigorate us after our walk through the reserve's native flora and fauna, we will stop in a typical local restaurant, where we will sample some delicious fish couscous and other typical Trapanese specialities. After lunch, we will have some free time for shopping.